Anyone who’s ever cooked any sort of turkey, wild or domesticated, knows that the breast meat can get dry in a hurry. Smoked turkey breast chief among them. 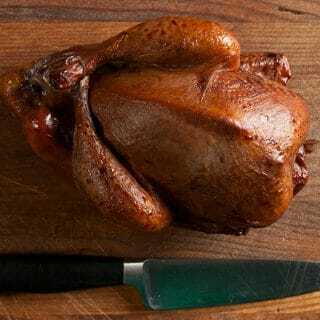 You want that tender, juicy turkey breast, smoky, maybe a touch sweet, but you don’t want it dry as the Sahara, or with the thinner, tail end of the breast turned into jerky. 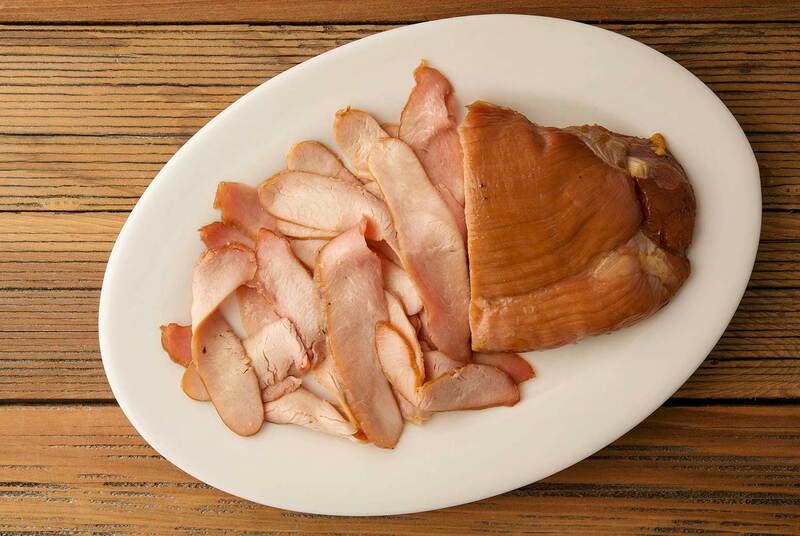 The second technique is to brine or salt cure the meat: That’s the secret to fantastic smoked turkey breast. And smoking a wild turkey breast requires a salt brine. Period. If you are not familiar with what brining does, it uses the power of salt and osmosis to slightly denature the proteins in the meat, swelling them with salty moisture and trapping more liquid in the meat than it would otherwise be able to contain. So when you cook it, and you get the inevitable moisture loss heat causes, there was already so much moisture in the brined meat to begin with that it remains juicy. I use what is called an equalization cure for my “brine,” which is not really a brine. It’s dry salting. You do this by weighing the turkey breast in grams — yes you need a scale — and then weighing out 1.5 percent of that weight in kosher or sea salt. Add to this some brown sugar (that weight need not be exact) mix and massage into the turkey breast. Ideally you’d vacuum seal it and set it in the fridge for at least 3 days, and really up to a week or more — this cure will not make the turkey breast too salty, unlike other ways of brining or salt curing. 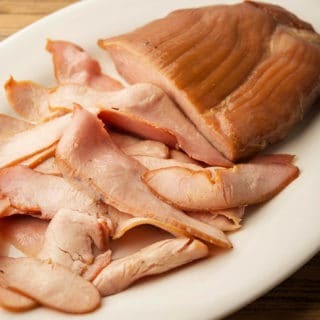 Once you have that set, you need to dry the turkey breast to form what’s called a pellicle on the surface of the meat. A pellicle is a thin sheen or skin of denatured proteins that, when it drys out a bit, becomes tacky. This allows smoke to adhere to the meat far better then if you put wet meat into a smoker. This is an important step in smoking ignored by a lot of amateurs. Don’t be that guy. To give the turkey one last punch, I paint it with something sweet. I used honey here, but maple syrup, birch syrup, agave nectar, a fruit syrup or even molasses would work. Why do this? 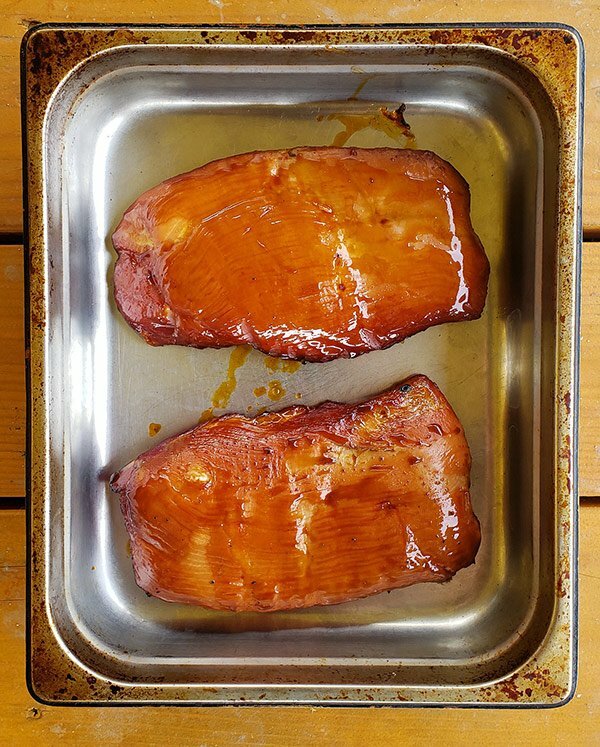 Um… is there a person on earth who doesn’t like the combination of sweet-salty-smoky-meaty? A word on smoke: I used cherry for this, and as always I leave you to your preferences on smoke. Whatever you want will be fine, only no conifers! Pine pitch and turpentine are not good eats. Finally, keep in mind this is my recipe for one smoked turkey breast; you can easily scale this up to smoke as many as you want. 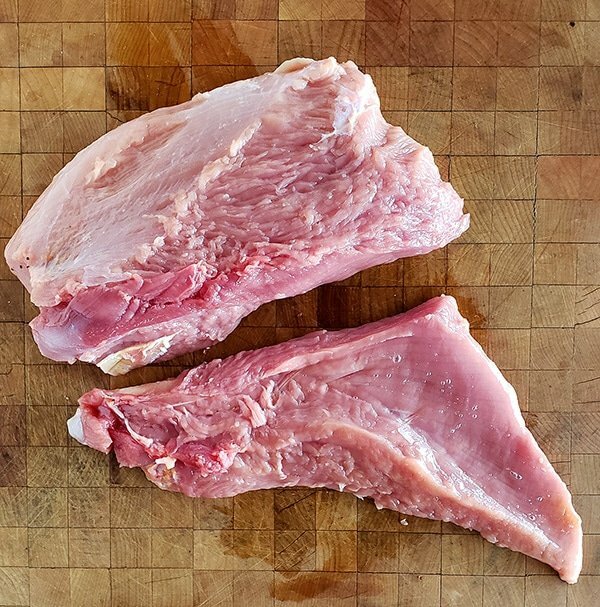 To trim, I slice off the thin triangle of turkey breast that lays over the tail end of the breast -- you will notice that all bird breasts have a thick and a thin end, and you are trimming the turkey's breast so you have, more or less, a big cylinder of meat that smokes better. Mix together the salt and sugar. Massage the mixture into the meat and, ideally, vacuum seal it. If not, put the salted turkey into a freezer bag. Set in the fridge for at least 3 days to cure. Remove the turkey breast from the bag and set it in the fridge, uncovered, for an hour or three to form the pellicle, a sheen that allows the turkey to take on smoke better. Turn the turkey over a few times while you do this. Don't skip this step! Smoke the turkey slowly at about 200ºF until it reaches an internal temperature of about 160ºF -- this takes about 4 hours with my smoker. Let the turkey smoke undisturbed for an hour, then paint it with honey every 45 minutes or so until it's done. When the turkey is ready, take it out of the smoker and set it on a rack. Paint it one more time with the honey and serve any way you like it: Warm for dinner, or cold for sandwiches. Once made, the smoked turkey will keep in the fridge for a week or so, and can be frozen (vacuum-sealed is my preference) for up to a year. 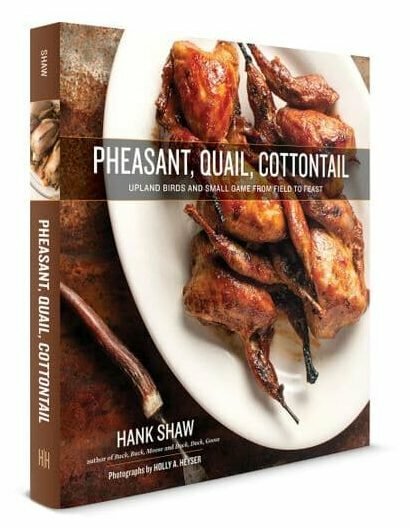 Find all sorts of recipes for wild turkey as well as other upland birds here on Hunter Angler Gardener Cook! I’ll be honest Hank, I had trouble with this one. For this recipie (and corned venison as well) I find the brine guidelines are always way too salty. Personal preference maybe. Looks like a great recipe, I smoked my first turkey breast last year with out curing and it came out OK (not great). Hope to try this recipe this year. Curious whether you rinse off the brine before resting to form the pellicle? Recipe doesn’t mention it explicitly, and I’d think the final product would be very salty if not.